We’re excited to present you with another high-class publication. Introducing “CAVY SAVVY, the 2-in-1 Cavy Study Guide and Activity Book”, at your service! Modeled after our two most popular rabbit publications, this book helps youth members capture success with their animal project by mastering the knowledge they need. 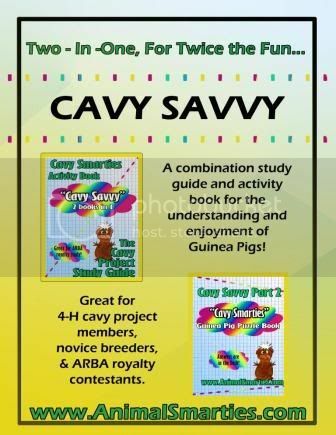 Cavy Savvy Part 1: The Cavy Project Study Guide offers practical advice on launching a guinea pig project and basic cavy care and health management, and then touches on the finer points of cavy breeding and competition. Information is supplemented by charts, color photos, and other visual aids for easy comprehension. Each page covers only one general topic, so club leaders using this book as a study aid can simply find the subject of their lesson for the night, photocopy that page and distribute it to their members. Cavy Savvy Part 2: Cavy Smarties is packed with colorful puzzles, games, and activities to help reinforce the knowledge gained in the first part of the book. A complete answer key is included. Written specifically for youth members, Cavy Savvy guides not only the cavy owner but also young rabbit breeders who do not raise guinea pigs but need a basic knowledge of these critters to excel in ARBA royalty contests. ARBA royalty tips, and more! Can you find the cavies hiding in the cave?